Flat, straight, and fast! Out-and-back along the Chesapeake & Ohio (C&O) Canal Towpath, starting at Mile Marker 11 (northwest end of the Carderock Recreation Area) and heading toward Georgetown. 20 Miler turnaround at Key Bridge (Mile Marker 1). 5 Miler turnaround between Lock 9 (mile 8.70) and Lock 8 (mile 8.33). 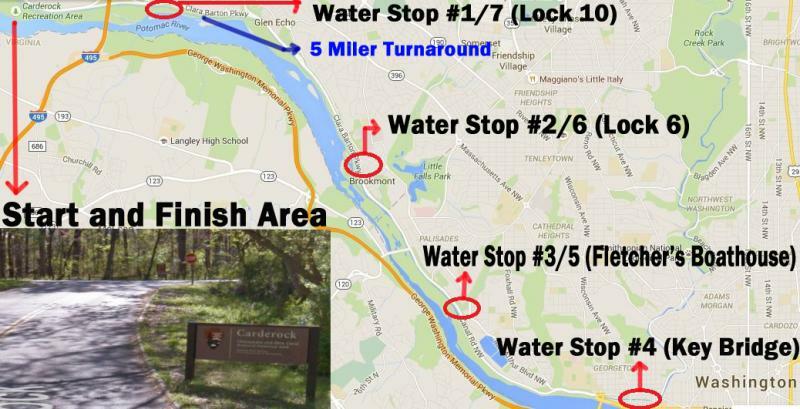 Aid Stations: We expect to have aid stations at approximately 2.5-mile intervals (Locks 10, Lock 6, Fletcher’s Boathouse, Mile 10 turnaround at Key Bridge).